I’m still looking to find more about Donna’s time in the Spring of 1924. I know she was in Bridgeport, CT in early February but have nothing on her whereabouts until she appears in Billings, Montana, at the Babcock Theater on May 17th and 18th. There is a lot of time and there are many places between the two shows. More to research. I also know on June 2nd she is in Oakland, California. Although it is only two weeks later, I doubt she went that distance without a few shows along the way. So much more to research. At the time it was built, at the time was considered the largest theater between Minneapolis and Seattle. The Julius Cahn Gus Hill Theatrical Guide, 1922 Supplement, reports that the Babcock Theatre seated 1200 people and the stage was 36×32 feet. arch failed, the stage was ruined and the amazing pipe organ demolished. The owner at the time considered rebuilding as entirely apartments or hotel, but decided to rebuild as a theatre. Within six months it was rebuilt. The reopening was a huge affair with the street being closed to handle the crowds, bands playing, and telegrams from Hollywood celebrities including Katherine Hepburn, W.C. Fields, Mae West, and Bette Davis [iv]. Today, after extensive renovations from 2008 through 2012, it houses 14 apartment units, retail shopping, and again operates a theatre for live performances. [v] The next live show scheduled at the Babcock is D. L. Hughley[vi], stand-up comedian, the original host of “Comic View”, and the eponymous character of The Hughleys. Ninety years after Donna Darling and Company performed, comedy is still alive at the Babcock. Gazette, 18 May 1924, Page 16. Note: This post was reformatted on 27 April 2018. [i] The Billings Gazette (Billings, Montana) 17 May 1924, Sat • Page 3 – Advertisement: Babcock Theatre – “Donna Darling and Company “ Source: Newspapers.Com, et al. 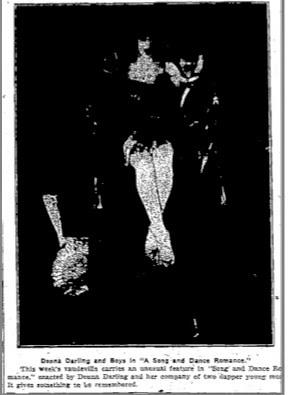 [ii] The Billings Gazette (Billings, Montana) 18 May 1924, Sun • Page 16 – Feature Vaudeville_Act. Source: Newspapers.Com, et al. I would love to see it. Donna did several bathing beauty shows from 1920 until 1925. I haven't determined which years & dates she showed in Danville, yet. I'm still researching Donna's career. I know she was in Decatur, IL, 25 Jan 1925, which is the most likely year for her to have been in Danville on Feb. 15th.